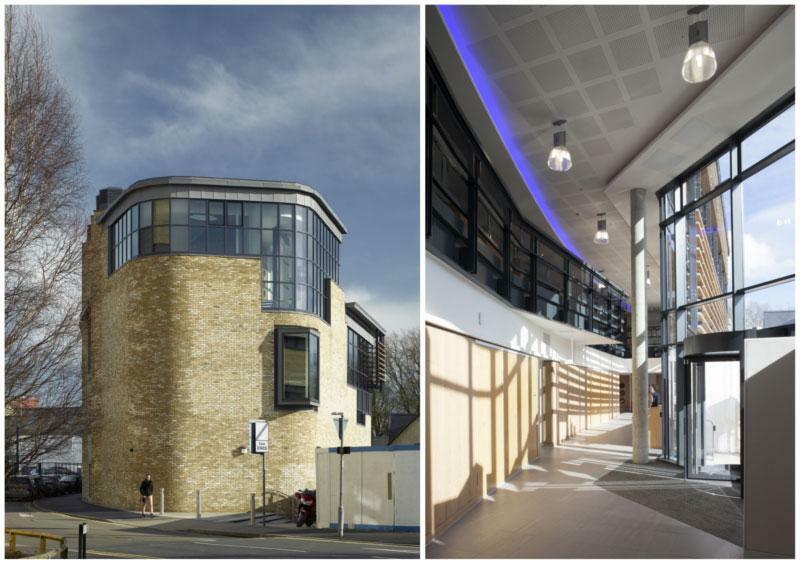 The first phase of our £12m academic buildings have been handed over to Anglia Ruskin University for occupation by the Faculty of Health and Social Care and students have started using the building. Phases 2 and 3 have started on site and are being built by R G Carter who also constructed our nearby Music Therapy project, finished in September last year. With the completion in August 2015 of these last phases the entire new Young Street campus will be concluded. Our joint project with RPP Architects of Belfast has now been completed for the Belfast Health and Social Care Trust. Staff will begin to take occupation towards the end of April. The project provides a unique combination of mental health facilities providing a range of out-patient, talking therapy and day treatment facilities together with a Home Treatment House facilitating short term residential treatment in a non-acute environment. When the landscaping has become established we will be publishing photographs of the completed exterior, hopefully, later this year. In the meantime, the picture shows the interior of one of the consultation rooms. Design work is progressing apace on our office building design (H5) with a view to commencing on site in Spring 2015. Meanwhile, we have been commissioned to submit planning for a new hotel to replace the office building originally proposed for the rear of the site (H3). A planning application is anticipated in June. Our project for the Royal and Ancient Golf Club at St Andrews has been granted planning permission unanimously by Fife Planning Committee. The 80 cover facility sits on the roof of the existing golf museum which has its entrance and foyer also substantially reorganised. 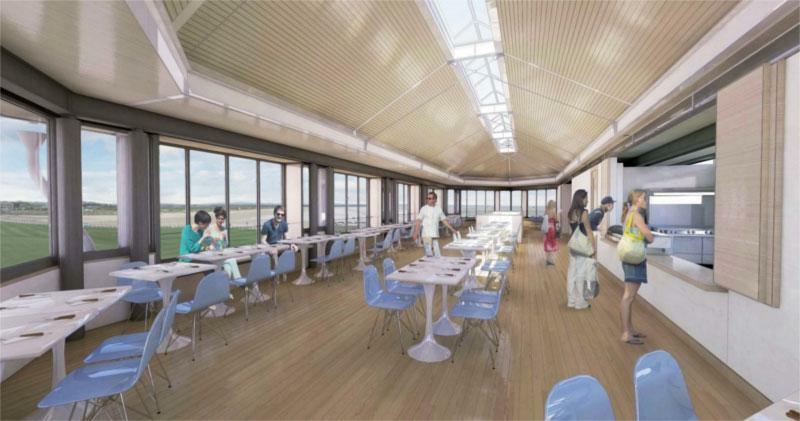 Diners get a panoramic view of the first fairway, the sea and also external dining on a terrace adjacent to “the Scores.” The project will be on site this Autumn and be completed before the 2015 Open Championship. Lowther Homes have commissioned us to design seven mews houses for sale on Redlands Lane to the rear of the Great Western Road in the west end of Glasgow and a planning application has just been submitted. A new web page describes their design. Our joint project with Taylor Architects of Castlebar Co Mayo for a €4m Euro centre for theatre and performance for the National University of Ireland in Galway has also been submitted. A new web page describes the design. 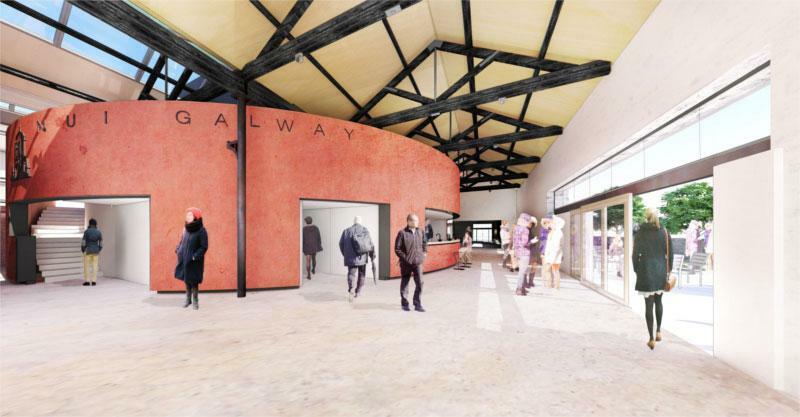 The theatre and associated rehearsal spaces convert historic industrial buildings in the heart of the Galway campus. The project is anticipated to be ready for the academic year 2015/16. 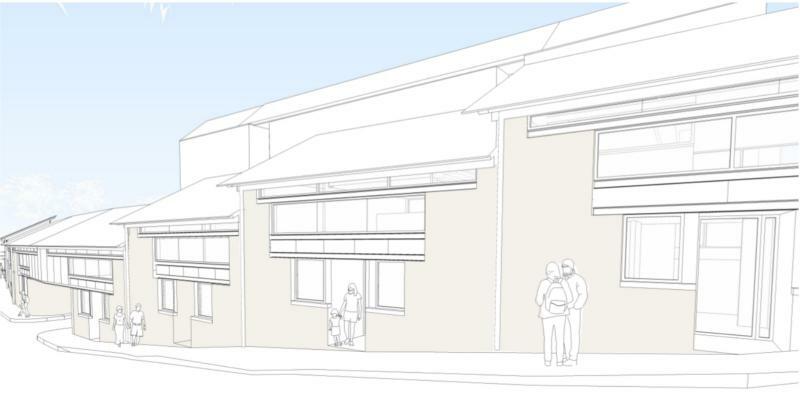 A competition winning project with RPP Architects for a 64 bed residential dementia home for the Belfast Central Mission of the Methodist Church has also just been submitted for planning permission. 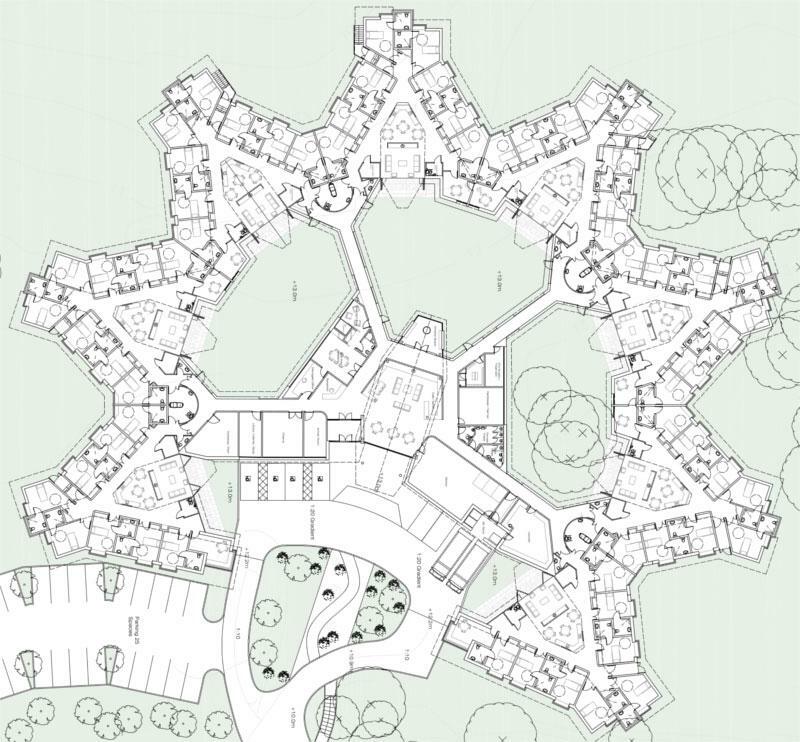 “Copelands” as the project is now known is a single storey design with eight households each of eight rooms clustered around an open kitchen dining and living space. There are no corridors. The entrance and central facilities are reached along the edge of a number of walled gardens. The whole building sits on a bluff looking out to sea. Richard was one of a number of speakers at a conference to launch the project at Stormont attended by Members of the Northern Ireland Assembly and there was a general recognition that this project is breaking new ground in design for dementia care. 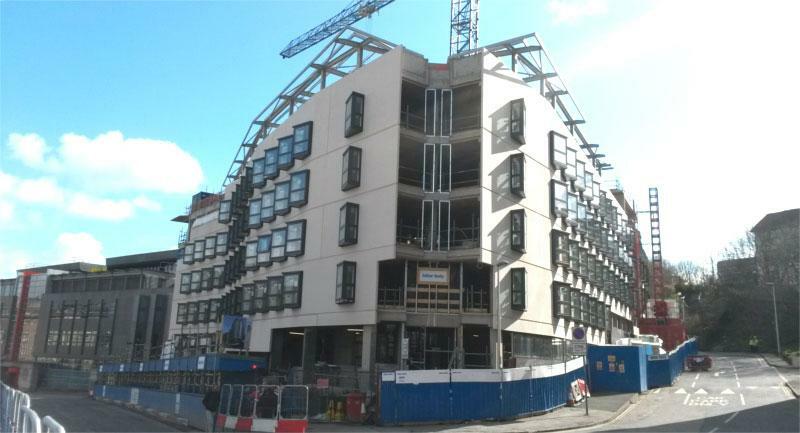 Our first use of precast concrete wall panels can now be seen on the external elevation of our project for 250 postgraduate bedrooms for Edinburgh University. The entire elevation of the building, including the windows, was craned into place in four weeks! The project is due for completion this Summer. Judging by the number of onlookers in the street, there is a great deal of interest in the progress of the new house for Richard himself in Hart Street in the New Town of Edinburgh. 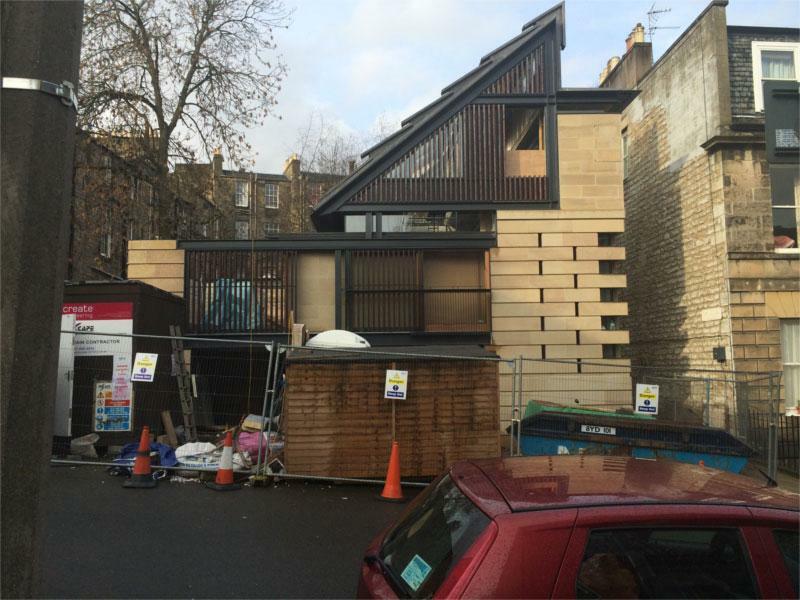 This week the scaffolding was struck and the next two months should see the interior of the house completed. Richard has lectured at his Alma Mater Newcastle University and also at Sheffield University. Bill Black lectured about the work of the office at the Student’s Architectural Society, 57’10, at Aberdeen School of Architecture and James Mason is talking at Dundee School of Architecture. Richard has accepted an invitation to judge a competition in India in January 2015 and he is shortly to be judging a children’s competition designing a new Maggies Centre. In February we welcomed a group of students from Leicester School of Architecture who visited the office and Richard’s new house for a technical case study. Our Museum and Art Gallery in Dunfermline was featured in the Fife Courier in February when–in an article titled “Dunfermline Museum and Art Gallery developers promise “showpiece” attraction. 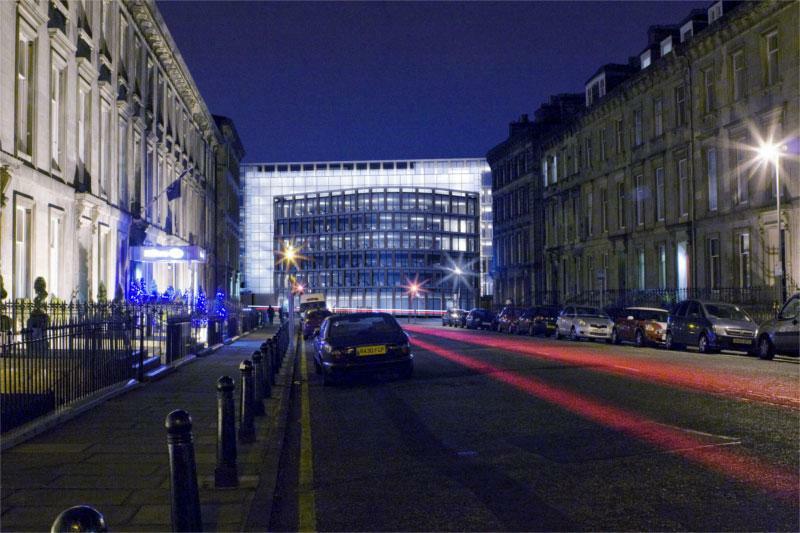 It was announced that BAM Construction had been awarded the contract to build the Museum, which will be the town’s first purpose built museum and “the first to tell the unique history of Scotland’s ancient capital”. Our successful planning application in February for the British Golf Museum Café in St Andrews was mentioned in both Urban Realm and the Fife Courier. The success of the application was welcomed and Fife Council’s Service Manager described the application as being of high quality and “a well considered design”. Richard was interviewed by ArtWork Magazine in February and featured in its March/April 2014 edition. 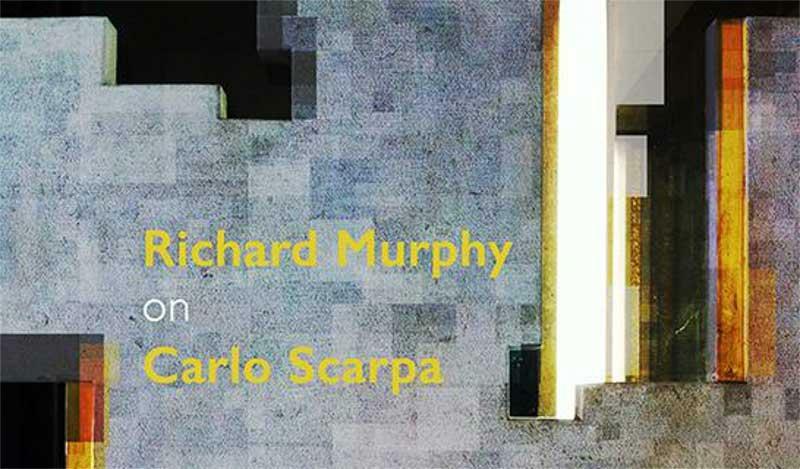 Entitled “Richard Murphy – architectural conscience of a nation” Richard gives his personal thoughts on the current state of the architectural sector in Scotland today. The last newsletter mentioned homage to the garden of the Querini Stampalia in the roof terrace of the Hart Street House. This edition shows a similar homage in the same project this time to Scarpa’s hinging stone door on the side elevation of the Olivetti Showroom in the Piazza San Marco combined with the famous “disappearing corner” pivoting windows in Rietveldt’s Schroder Schrader House in Utrecht. The master-bedroom corner stonework has two secret pivoting and hinged stone panels which open on a sunny morning to create a corner-less vista!